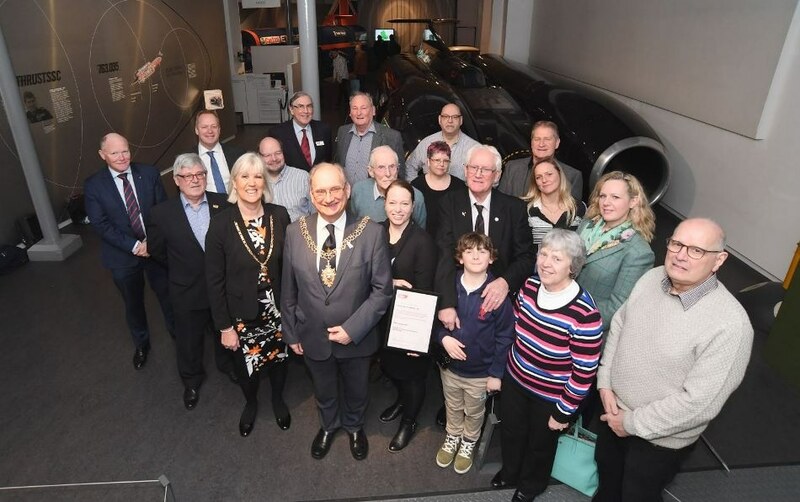 The first land vehicle to break the speed of sound, which is housed in Coventry Transport Museum, has been honoured with an award that puts it alongside engineering greats such as Concorde and The Channel Tunnel. The iconic 54 ft long Thrust SSC reached a speed of 764mph in the Black Rock Desert, Nevada in October 1997 and has since been on permanent display in the museum's land speed gallery. The Institution of Mechanical Engineers (IMechE) has now presented the team behind the vehicle and the museum with the Engineering Heritage Award. It is only the 125th award to be gifted by the IMechE since it established the honour in 1984. Concorde, The Channel Tunnel, The E-Type Jaguar and Alan Turing’s Bombe at Bletchley Park are all previous recipients of the award. “Coventry is known for its innovation and our inventions have helped to change the world. “Thrust SSC is a vehicle that means so much to the city and now it takes its rightful place among some incredible, iconic achievements in engineering. “When it comes to individual artefacts, it’s not an easy decision to make and our aim is always to ensure that only the very best and unique are honoured by the award. “We are now in our 36th year and Thrust SSC is only the 125th award to be given. The vehicle and the team behind it were working in completely unchartered territory and what they achieved was quite extraordinary. Visitors to Coventry Transport Museum can ride a 4D simulator that puts them at the heart of the land-speed record attempt. Tickets for the simulator are priced at £5 for adults and £3.50 for concessions.